The new report by Zion Market Research on the “Central Venous Catheters Market By Design (Single-Lumen, Double-Lumen, Triple-Lumen, and Multi-Lumen); By Product Type (Tunnelled and Non-tunnelled); By Property (Antimicrobial coated and Non-antimicrobial coated); By Material (PVC, Teflon, Polyurethane, Polyethylene, and Silicon); By Application (Jugular Vein, Subclavian Vein, and Femoral Vein); By End User (Ambulatory Surgical Centers (ASCs), Hospitals, and Specialty Clinic): Global Industry Analysis, Size, Share, Growth, Trends, and Forecast 2016 – 2025" has a vast information about the market and its potential. The global central venous catheters market was valued at around USD 740.0 million in 2016 and is expected to reach around USD 1,140.0 million by the end of 2025, growing at a CAGR of 4.9% between 2017 and 2025. The demand for the minimally invasive surgeries has increased over the past few years owing to the fact that such type of procedures reduces the risk for postoperative complications. The central venous catheters are used increasingly in the minimally invasive surgeries thus increasing its demand in the global market. The research analysts in their primary research observed that inadequate quality check for the catheters is limiting the growth of the central venous catheters market. By design, the multi-lumen segment dominated the central venous catheters market. The multi-lumen segment contributed over USD 270 million in 2016. The multi-lumen catheters have the facility that it reduces the frequency of the catheter insertion which helps multiple drugs to be inserted with one catheter. Hence, in cases where multiple central venous accesses are required multiple catheters are used thus increasing its popularity in the global market. The non-tunneled central venous catheter is expected to hold a major market share by product type in the global central venous catheter market. In emergency situations, the increased use of the non-tunneled catheters for the blood withdrawal has increased its demand in the global market. By property, the antimicrobial coated central venous catheters segment is expected to register high CAGR during the forecast period. In order to reduce the risk of microbial infection, the catheters are coated with antimicrobial agents. Thus the antimicrobial coated central venous catheters are having an increased utilization. By material, the polyurethane segment is estimated to hold the majority of the market share in 2017. The polyurethane catheters are used increasingly as it is soft and compatible thus being preferred over silicon. The central venous catheters are majorly used in the jugular vein route. As jugular vein route has a lower risk of catheter-related bloodstream infection it is being used increasingly. By end-user, the hospital's segment dominated the global central venous catheters market. Quality facilities that are provided by the hospitals and the increased surgical care obtained from the hospitals are some of the factors that are driving the market growth. North America central venous catheters market contributed a major share of over USD 250 million in 2017. The rapid development of the medical facilities and the well-developed healthcare infrastructure are the factors that are driving the growth of the market in this region. 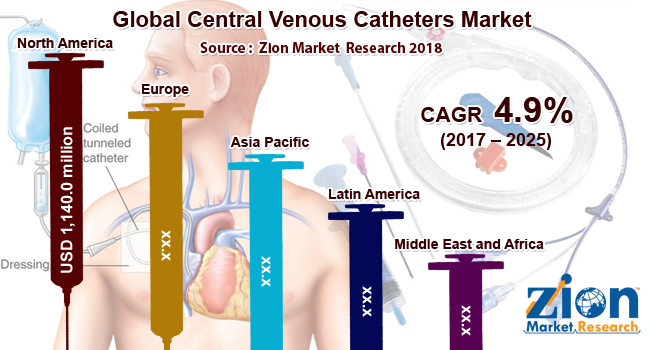 The major market players involved in the central venous catheters market are AngioDynamics, B. Braun Melsungen AG, Becton, Dickinson and Company, Citius Pharmaceuticals, Cook Medical, Edwards Lifesciences Corporation, Guangdong Baihe Medical Technology Co., Ltd., Intra Special Catheters GmbH, Kimal, Lepu Medical Technology (Beijing) Co., Ltd., SCW Medicath Ltd., Smiths Medical, Teleflex Incorporated, TuoRen Medical, Vogt Medical, Vygon (UK) Ltd., ZOLL Medical Corporation. The global central venous catheters markets segmented on the basis of the design, product type, property, material, applications, end-user, and the geographical regions.